If you’ve eaten locusts, tripe or sweetbreads (yep, all kosher), chances are you’ve got one man to blame: Andrew Zimmern. 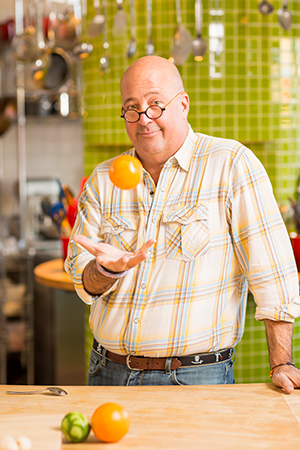 As the host of Travel Channel’s Bizarre Foods with Andrew Zimmern, the Minneapolis-based chef traverses the globe exploring the seemingly inedible, tasting it all on camera and delving beyond each bite into the wider context—be it political, social or anthropological. He’s a well-respected presence in the food world and a world-class raconteur, lecturer and writer. ​When I spoke with Zimmern over the phone, he had just returned from Chicago, where he had been a presenter at the James Beard awards, prizes that honor chefs and other culinary luminaries for their accomplishments. The event fell on Israeli Independence Day, and Zimmern—a four-time award winner himself for his work on Bizarre Foods—watched as Michael Solomonov and Zach Engel, two chefs who ply their trade in Israeli-themed restaurants, earned top honors. Philadelphia’s Solomonov was crowned outstanding chef in the United States for his pioneering work at Zahav and a growing chain of other restaurants in Philadelphia, New York (and, soon, Miami); and Engel was named best rising chef for his work at New Orleans’s Shaya. ​“The foods of the Levant are definitely having their moment,” Zimmern, 54, said, referring to the region that includes Egypt, Iraq, Israel, Lebanon, Syria and Turkey. “You could sort of see this coming for a while,” he added, citing the influence of chefs like London-based Yotam Ottolenghi, whose popularity paved the way for the prevalence of so-called modern Middle Eastern cuisine. “It makes sense, when you’re looking for that pop of flavor, nothing delivers like preserved lemon, pomegranate syrup or za’atar,” three ingredients in the Israeli kitchen canon. ​Zimmern’s own Jewish food history begins on the better-known Ashkenazic side of the Jewish food spectrum. Born and raised in New York City by parents who eventually divorced, Zimmern attended private school on the Upper East Side. Saturdays were spent strolling the Upper West Side with his paternal grandmother, Henriette Zimmern, who long served as sisterhood president at the Mount Neboh Synagogue on West 79th Street. ​“She was a neighborhood star,” Zimmern said of his beloved grandmother, whose status earned him a steady stream of free tastes from local shopkeepers. On Sundays, Henriette would make a Jewish lunch for Zimmern and his cousins that included gribenes with schmaltz and sweet-and-sour tongue. “Try as I might, to this day I can’t say I’ve quite nailed that tongue recipe,” laughed Zimmern, who concedes that his fondness for the exotic cut of meat may have foreshadowed his future career. 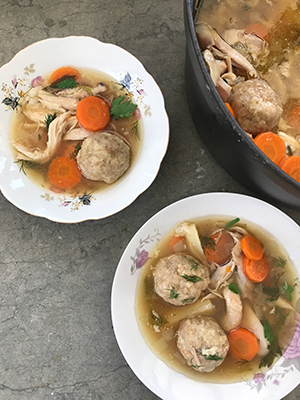 ​“When I want that hug that food can give, I make her chicken in a pot,” said Zimmern, who remembers the dish down to the last detail, including the bread dumplings she would make out of leftover challah. ​After graduating from Vassar College, Zimmern worked in renowned New York restaurants, such as Rakel and Arcadia, but flamed out after his alcoholism and drug addiction spiraled out of control to the point that he found himself homeless. Friends eventually compelled him to check into the renowned Hazelden institute in Minnesota. After getting sober, he spent six years helming the popular Minneapolis restaurant Café Un Deux Trois, which led to local television appearances and, eventually, Bizarre Foods. It was also in Minnesota that he met his wife, Rishia Haas, with whom he has a son, Noah, 12. ​Though his work takes him around the world several times a year, Zimmern has chosen to make his home in Minneapolis, partly to stay close to the Hazelden community, where he volunteers on a regular basis. ​Perhaps owing to his own experience with homelessness, Zimmern has a soft spot for underdogs—those on the margins of mainstream society. In fact, when I spoke to him, he mentioned an upcoming fundraiser he would attend for Services for the UnderServed, a New York City organization that helps those that society forgets: addicts, the homeless, single mothers with nowhere to go. He is also a passionate advocate for immigrants, seeing food as a way to break down barriers and create understanding. ​This philosophy was on display when Bizarre Foods traveled to Israel for season three in 2015; Zimmern’s desire to reach across fences was clear. In addition to eating at Jewish-owned hotspots like Jerusalem’s renowned Machneyuda, he ventured to Bethlehem to visit a group of Arab women forming a couscous cooperative and partook of a Ramadan fast-ending Iftar meal with a Palestinian family in East Jerusalem. ​This set of recipes is sure to set the stage for any friendly gathering. 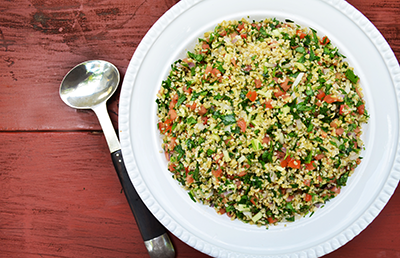 The tabbouleh and chickpea salad—easy summer examples of modern Middle Eastern cuisine—can be made in advance, and Henriette’s genius challah dumplings may dissuade you from making matzah balls ever again. Adeena Sussman is a cookbook author and recipe developer based in New York City and Tel Aviv. Her latest cookbook is Short Stack’s Tahini. If you prefer, use any chicken stock you have in the house and omit the first part of this recipe. But making Henriette’s deep, rich stock is a worthwhile endeavor, with leftovers you can freeze. 1. Make the stock: Preheat oven to 375°. Place 3 pounds of the chicken parts on a large rimmed baking sheet or roasting pan and roast until browned, 45 minutes. Transfer to very large pot—at least 8 quarts. Add the remaining 3 pounds of chicken along with the carrot, celery, leek, onion, parsley, bay leaf, peppercorns and 16 cups of water. Bring the pot to a simmer, reduce heat to its lowest setting, cover and cook for 24 hours, checking that the liquid is just moving slightly but not bubbling. 2. Strain slowly, tipping out the broth and discarding the solids. Freeze or refrigerate stock over-night, then skim off the solidified fat and reserve; this is the schmaltz you will need for the dumplings. Reserve 8 cups of the stock; refrigerate or freeze the rest for another use. 3. Let the whole chicken come to room temperature for 90 minutes. Add the reserved 8 cups of stock to a large stockpot and bring to a simmer. Add the whole chicken, cover and poach very gently for 75 minutes until chicken is tender. 4. Remove the chicken to a platter and cool. Pull the meat from the bones and discard the skin and bones. 5. Bring the broth to a light boil and reduce for 10 minutes. Meanwhile, make the soup: peel and trim the carrots, onion, parsnip and rutabaga into small pieces and add to the broth with the dill and the celery leaves. Simmer briefly, about 15 minutes. 6. While the soup is simmering, make the dumplings: Whisk together the egg yolks, water and schmaltz, then whisk in the garlic, shallot, bouillon, baking powder and nutmeg. Put the torn bread and matzah meal in a bowl, then pour the egg mixture over them and stir, adding more water if necessary to form a ball of dough. 7. Using wet hands, form 12 golf-ball sized dumplings, gently lower into the soup, cover and simmer until tender, 15-20 minutes. Serve immediately. 1. Place the chickpeas in a stock pot with the bay leaf and garlic cloves, adding enough water to cover them by 3 to 4 inches. Bring to a boil slowly, skimming the foam as it starts to heat up. Once boiling, turn down to medium and cover. 2. Keep your eye on the chickpeas as they cook. If the water boils too hard, take off the lid and, if you later lose a light boil, throw the lid back on. It will take a good 2 to 3 hours before the chickpeas are cooked. You want them to be tender and soft, not al dente. 3. 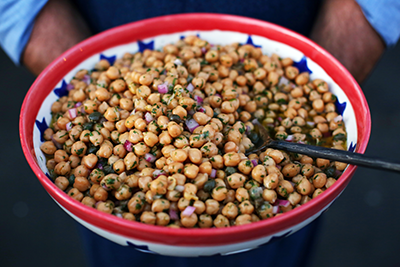 To make the salad, drain the chickpeas and toss in a bowl with the olive oil. 4. Place the diced onions in a separate bowl and season with the salt and sugar. Let sit for 5 minutes, then add the vinegar. Stir to dissolve the salt and sugar. Season with pepper and then pour over the chickpeas. 5. Add the capers, chopped herbs, half of the lemon juice and an extra drizzle of olive oil. Taste for seasoning, adding sea salt, pepper and additional lemon juice if necessary. 1. Wash bulgur wheat in several changes of cold water, until water runs clear. Drain well. 2. Soak the bulgur wheat for one hour in cold water to cover. 3. After an hour, drain the wheat in a fine sieve and place in a large stainless steel bowl. 4. Add all remaining ingredients, tossing well. Season with the salt and freshly cracked black pepper. Cover and refrigerate for 2 hours. 5. Remove from fridge one hour before serving, and adjust seasonings as needed. The recipe for chicken soup takes WAY TOO LONG !!! I make my own chicken soup, matzoh balls which is famous in the community I live in. It takes only a couple of hours. Also, I have lost respect for Mr. Zimmer after learning of his drug use and other problems, and eating such weird foods. So, I would not even think of using his recipes. Would love to see your recipe for chicken soup recipe. Loved the article look forward to making the soup. Miss my Grandma Licha’s cooking. Not much good Jewish food in Portland. I guess Ihave to learn to make my own but I am not much of a balaboosta. I would rather dance than cook, but love to eat. Wow, my Mom’s chicken soup recipe exactly minus the peppercorns and dumplings! I have even more respect for Andrew Zimmern as he publicly embraces his Judaism and support for Israel. I also applaud his outspoken advocacy and presence at the life-changing FareStart program here in Seattle. Thank you for this wonderful article.